As far as herbs, chamomile is one of the most popular herbs worldwide. It is commonly used in herbal teas on its own or in blended teas. While herbal teas are not technically considered real tea from the Camellia Sinensis plant, they still have plenty of health benefits regardless. This article gives a brief overview of some fun facts I discovered when reading about chamomile tea. Here are some random facts that I learned during my research: (1) Chamomile is actually the national flower of Russia, (2) Roman Chamomile is used to dye fabrics a yellow color and as a rinse for blonde hair, (3) Buckingham Palace actually uses chamomile instead of grass on its lawns, and (4) Chamomile has been traditionally used to treat more than 100 medical conditions (whether it works depends on the ailment). Check out the chamomile tea on Amazon . Chamomile has a taste similar to apple and the word “chamomile” is said to come from the Greek word Kamai-melon or ground apple. The Spanish word for chamomile is manzanilla, which means little apple. As far as its aroma, it can be described as floral or fruity. Chamomile does have a bitter aftertaste, which is claimed to increase its medicinal properties on the stomach. How many types of chamomile tea are there? The two main types of chamomile are Roman and German. Roman chamomile is from Western Europe and North Africa, which flowers in late spring or early July. German chamomile is from western Asia, and unsurprisingly, was used in making beer. German chamomile is more popular and has been studied more extensively, although both versions have good health benefits. How long has chamomile been used for? The use of chamomile can be traced back as far as 1550 BC to Egypt where it was actually mentioned in a document called the Ebers Papyrus. It is said that the ancient Egyptians used chamomile to embalm the dead, cure the sick, and as part of their religion. Where can I buy chamomile tea? You can buy it almost anywhere tea is sold whether in the grocery store, a tea shop, or you can check out the Chamomile Tea at Amazon . 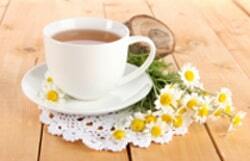 Chamomile is said to have a soothing and calming effect on the nervous symptom. It is also said to assist with fighting ulcers, and that it is an anti-inflammatory and disinfectant. Many natural sleep remedies contain chamomile in their ingredients. Can anyone drink chamomile tea? Some people do have allergic reactions to chamomile since it is a plant in the aster/daisy family. If you are allergic to such plants, there is a high likelihood that you may be allergic to chamomile. Usually people who have allergic reactions to ragweed, echinacea, mugwort and additional flowers in these families should use chamomile with caution. There are also warnings that chamomile may not be healthy to drink during early pregnancy. I personally enjoy a nice cup of loose leaf chamomile tea at nighttime to relax. To me, it has a light taste that is soothing to drink. Some people even grow their own chamomile and claim it can be grown pretty much anywhere. Well, I hope this article taught you a little more about this beneficial herb. Feel free to comment on your experiences with chamomile tea.